If you buy the 2 pack beer from suntory you get a free squid. Anyone want to share with me? The snacks keep coming this week, but as we get towards the warmer weather there is a definite ‘sakura in pink’ theme starting to develop. New kit kats. The only thing that stays the same is the size of the box. This time we have Sakura green tea flavor. mmmmmmmm, got to try that out. Crunky has been a popular chocolate for some time. I am not sure about this new version, banana milk cereal, but the original will always be one of my favorites. Some mobi cookies from Tohato. 2 flavors to munch on. Some custard pudding throat sweets. Looks like custard pudding might be good hard as well as soft. Plenty of wasabi here for those that like it a little spicy. Biz from Morinaga have a cookies and cream version of their bite sized chocolate cookies, whilst Glico seem to have teamed up with Softbank to produce some white chocolate for Softbanks popular dog character. Was very surprised to see this, but also noticed an ad on tv for other Softbank cross branded products recently. Some convenience stores carry quite a good range of spirits in Japan. There is quite a good range here of roughly $10 bottles. I do not see any champagne like I did when in Akita a few weeks ago. Some custard pudding daifuku. Cannot quite tell how hey are making these daifuku taste like custard pudding, but it looks like there might be a caramel center to them. Have you noticed packaging in the stores start to change color for the different seasons? That crunky sounds good…but then again, Im a fiend for that artificial banana flavour! the last picture, the pudding daifuku are soooooo delicious!!!!! i ate more than a dozen of it haha. Conbini Monday Wk45, Japan Conbini Monday http://bit.ly/aQK0Uy Another great selection. Not to sure about the squid though. Does it have a fishy after taste. I mainly stick w the beef flavor over here. I would try any of the kit kat flavors, except for wassabi flavor. Am finding out that there are many different flavors of kit kats from all over the world. But finding a distributor or wholesaler is reaally becoming the hard part. Would you have any info you could share w/me? It would be much appreciated. 🙂 I was wondering also about that champange be sold in that conbini in akita-ken, regional maybe? Don’t think I’ve seen any sold in ours . That crunky looks mighty tempting, a definate must try. Will there be another conbini box offer soon? And you had mentioned a contest a week or so ago. Any news on that? I had a good laugh with the CUCU pudding. In french, cucu (or cucul) means naive, dumb, ridiculous, too precious… Well I hope the CUte CUbe pudding tastes nice. Great pictures!! 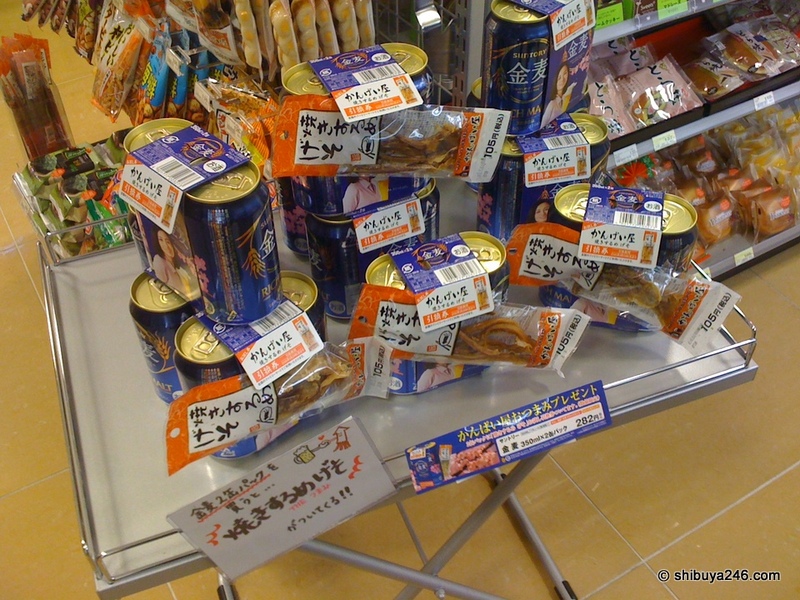 That`s one of the main things that I miss about Japan – all the great stuff in the conbini. I love the interesting Kit-Kats they come out with. Not a big fan of the dried squid especially the smell.